San Francisco's Grateful Dead brought its psychedelic blend of folk, bluegrass, and blues to the 1960s counterculture, along with a romance for the Beats and a love of anarchy that made it something more than a bond. Without radio play and virtually unnoticed by the press, the Dead forged a vast underground following whose loyalty survives to the present day. National Book Critics Circle Award-winning author Carol Brightman returns to the bond's roots - to Ken Kesey and the Merry Pranksters, the acid tests and the heady days of Haight-Ashhury, the free concerts in Golden Gate Park and the formative shows of New York's Fillmore East - to uncover the secrets of the band's longevity. Drawing on exclusive interviews With band members, staff and crew, Deadheads, other musicians, journalists - and her own experience as a '60s activist - Brightman shows us how, amid the turbulent Free Speech Movement and antiwar rallies, the Grateful Dead's abandonment to music, drugs, and dance offered the faithful a shelter in the storm. Her riveting, in-depth portrait of Jerry Garcia, the "nonleader leader" who held to a vision of the Grateful Dead's destiny even as he recoiled from the juggernaut it became, shows us how it was that a Dead concert become something halfway between a revival meeting and a family reunion. An absorbing and exhilarating exploration, Sweet Chaos offers, at last, a complete understanding of the Dead phenomenon and its place in American culture. 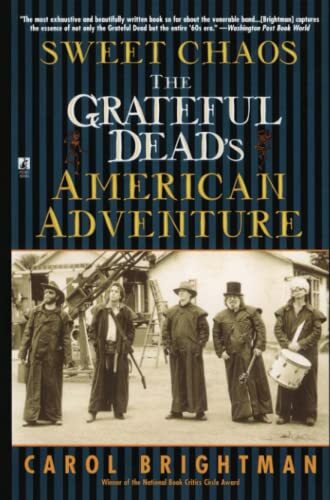 Washington Post Bookworld The most exhaustive and beautifully written book so far about the venerable band...[Brightman] captures the essence of not only the Grateful Dead but the entire '60s era. David Gans host of The Grateful Dead Hour and author of Conversations with The Dead Anybody who ever wondered about the Dead and Deadheads should read Sweet Chaos to understand why the significance of this culture cannot -- and should not -- be underestimated. Boston Globe Brightman is on engaging stylist....She knows how to put words to some of the more ethereal elements of the Dead world -- the vibe, the energy, the indescribable acid journey. Robert Christgau Los Angeles Times Book Review I found Brightman's retelling swift and compelling. And for a literary scholar to describe any species of rock and roll with such clarity, delicacy, and detail is a mitzvah, if not a miracle. Publishers Weekly (starred review) Entertaining....A cogent, intelligent look at the Dead and the deep structure of American culture into which they so successfully tapped. Village Voice The author [has] precisely the near distance that a Dead book needs in order to transcend, while tasting, the obsessions of the band's cult...the strength and freshness of Brightman's book lies in her ability to articulate the band's considerable significance to the unHead. New York Observer [In] the chapters called "Their Subculture and Mine," Ms. Brightman offers something unexpected and rare: a moving, believable evocation of the despair that gripped New Left activists between 1970 and 1972, and an honest critique of their often panicked responses to that despair. Booklist One of the best books for devotees and pop culture vultures alike....An engrossing treatment of the Dead and their times....Throughout, Brightman offers fresh perspectives and insights and captures the flavor of the band. Raleigh News & Observer (North Carolina) [A] valuable, smart and ethically engaged account of political and cultural resistance in the '60s as a necessary preamble to what came next.